Mix together all ingredients except corn flour and breadcrumbs. Keep it in refrigerator for 1/2 hr. Make dry mixture of breadcrumbs and cornflour. 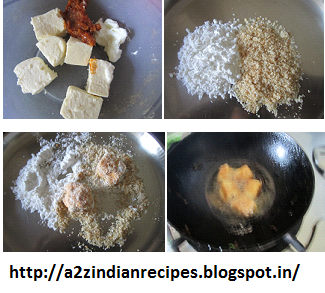 Now apply cornflour breadcrumbs mixture to paneer cubes. Then deep fry in oil till golden brown. Then drain the excess oil on absorbent paper. Serve hot with tomato sauce/green coriander / mint chutney.